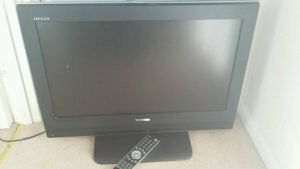 House Clearance Service In All Areas Freckleton Kirkham Warton Wrea Green. 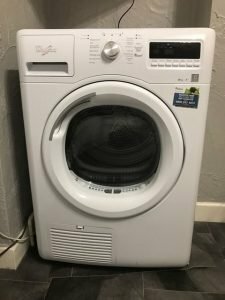 Hi, I am currently having some work done on my property in Wylam, the items i wish to keep i am putting into storage, there are a large amount of items we wish to get rid of, here is a list: 2 double beds, 3 wardrobes, a large chest of drawers, a sofa bed, a small fridge, a chest freezer and a washing machine. Please could you let me know how soon you can do this for me? Thanks, Elaine Roberts. 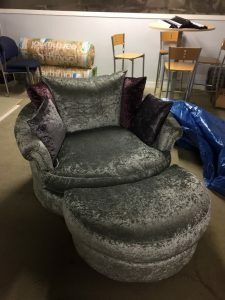 A circular swivel chair and matching half moon storage footstool, both upholstered in silver and purple crushed velvet. 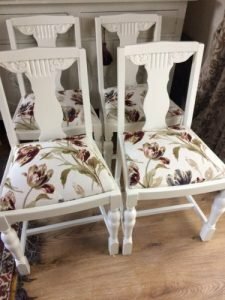 A set of four hand painted white solid wood dining chairs, in the shabby chic style, upholstered to the seats with floral patterned white fabric. 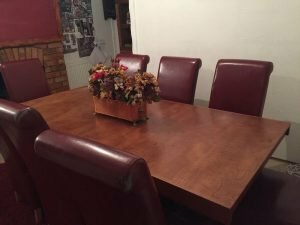 A teak extendable rectangular dining table, together with six matching high back dining chairs, upholstered in maroon faux leather. 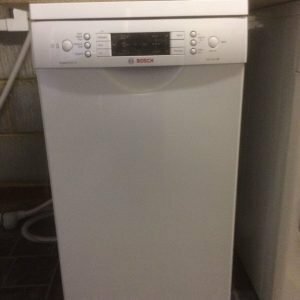 A white Bosch slimline free standing dishwasher. 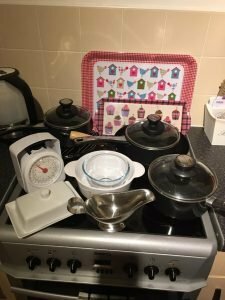 A small collection of kitchen accessories, to include three lidded saucepans, two plastic trays, a kitchen timer, two bowls, a lidded butter dish and a gravy boat. 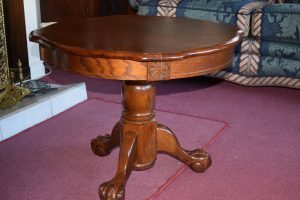 A vintage mahogany small occasional table, raised on three legs with lion paw feet. 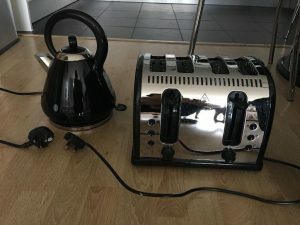 A black and stainless steel Russell Hobbs kettle, together with a matching four slice toaster. 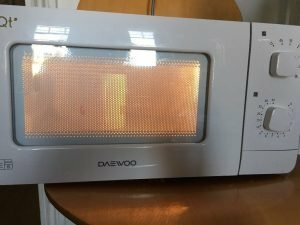 A white Daewoo Qt 6 auto cook 20L microwave oven. 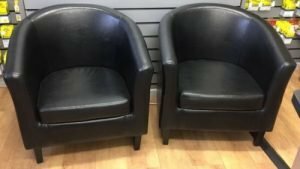 A pair of curved back tub chairs on solid wood legs, upholstered in black faux leather. 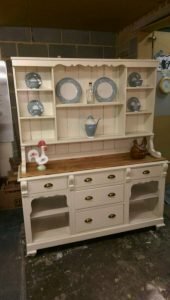 A hand painted cream solid wood welsh dresser, having five shelves above an oak counter top, with five drawers and two shelves underneath. 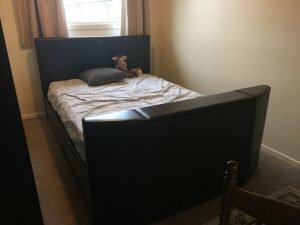 A three quarter double black faux leather upholstered bed, with three quarter double mattress. 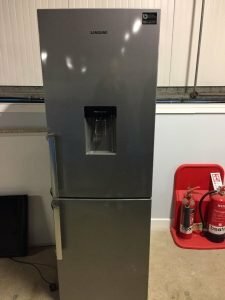 A tall standing two door silver Samsung fridge freezer, with built in water and ice dispenser. 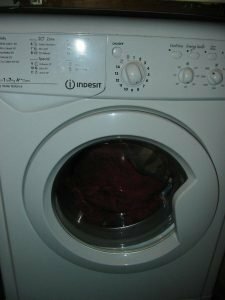 A white Whirlpool 9kg AZA9791 under counter condenser dryer. 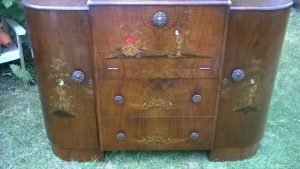 A vintage oriental art deco walnut cocktail sideboard, having a cupboard to either side of a central pull down shelf above two drawers, hand painted with oriental scenes.